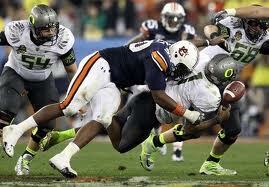 Cam Newton's combination of size, arm strength and mobility make him an extremely intriguing prospect. 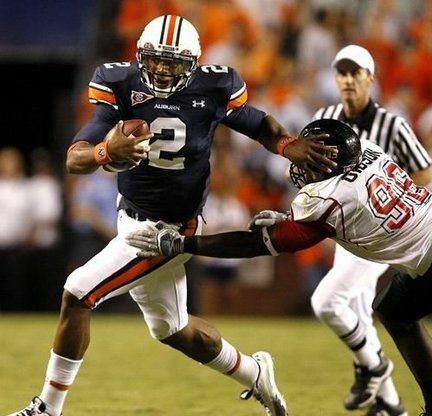 1st– Carolina- Cam Newton, QB, Auburn- Is this a logical pick? I don’t know, but I think it’s a possibility. I have heard rumors that Newton is being considered for this pick, and considering Jimmy Clausen’s sub-par rookie season last year (which isn’t necessarily an indictment on his career, but it wasn’t exactly encouraging) I could see Carolina going this way. Clausen and Matt Moore could hold down the fort until Newton was ready, that would keep him from being rushed into playing time. Now, Newton has incredible potential because of his size, arm strength and incredible athleticism but his accuracy is inconsistent largely because of his poor footwork. He could improve with coaching as most quarterbacks will, but I don’t think he will ever be an accurate quarterback. I personally think he will have a comparable career to Vince Young before he completely derailed in Tennessee; he will win games, extend drives and make plays thanks to his athleticism, but ultimately I don’t know if he has the mental capacity to lead a complicated offense and I don’t think he’s an accurate enough QB to consistently lead drives downfield. He will occasionally make a great throw, but then he will miss a relatively easy one afterwards. However, he has tons of potential, is incredibly well known and will help sell tickets which could ultimately sway the Panthers management to make him the pick. Bowers was a dominant pass rushing force this year, but will his sacks translate to the NFL? 2nd– Denver- Da’Quan Bowers, DE, Clemson- Do I agree with this pick? Honestly, not really. 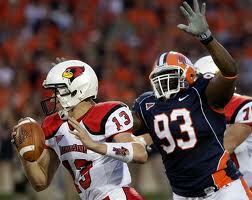 I am not a big Bowers fan because I am not convinced he has 8-10+ sack potential at LE in the NFL. However, he definitely produced this year and really filled up the stat sheet. He plays the run well, he is very strong, shows violent hand usage and shows some burst off the snap even if it isn’t much. I am not sure he will be a dominant pass rushing LE in the NFL, but he definitely has the potential to be a 5-6+ sack guy at that position even without great edge speed. However, I am not sure how good his motor is, how good his work ethic is and I am concerned that he only produced significant stats for one year and then immediately left for the draft. That doesn’t doom him as a prospect obviously, but it definitely makes me wary of him as a player. Regardless, he seems to be a top five lock at the moment and after his pro-day he should be a sure thing to go very early in the draft. It will be interesting to see if he lives up to that lofty draft status though. Dareus reminded everyone how good of a prospect he is at the NFL combine. 3rd– Buffalo- Marcell Dareus, DE, Alabama- Dareus seemed to be the forgotten man for a while as Nick Fairley shot up draft boards and seemed to be the leading man for the race to be the number one overall pick. However, Dareus reminded everyone how good of a prospect he really is by outperforming Fairley at the combine despite carrying more weight. Dareus really is a dominant defensive lineman and I think he will be a very good NFL player whether it is as 3-4 DE or inside at defensive tackle in the 4-3. 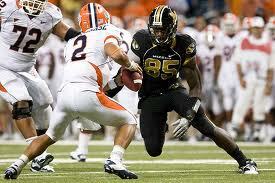 In this instance he would be playing DE in the 3-4, which I think he would be a perfect fit for in the NFL. 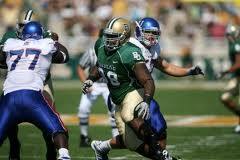 The Bills really need a quality defensive lineman and Dareus is extremely well rounded. He doesn’t do well when he is initially blocked as a pass rusher because he doesn’t have any secondary pass rush moves, but he is very disruptive against the run because of his quickness off the ball and he is incredibly strong which helps him with his bull rush as a pass rusher. Whoever gets Dareus is going to get a very good NFL player even if he doesn’t contribute right away as a rookie. It is just very hard to judge when a defensive lineman will be ready to contribute as a situational player or a starter before he gets to the NFL. A.J. 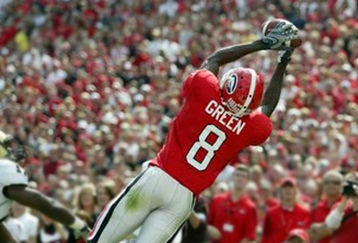 Green is not only the best WR in the draft, he may be the best overall prospect. 4th– Cincinnati- A.J. Green, WR, Georgia- People seem to be down on A.J. Green right now because he ran a 4.50 at the combine, but I can’t believe people are actually dropping him on their draft board because of it. The combine always gives draftniks impressions like this every year but there is absolutely no way that a team had Green graded as a top five talent and dropped him to a top ten grade or a top fifteen grade because he ran a 4.5 instead of a 4.45. That’s just not how smart teams operate. Green is potentially the best WR prospect since Calvin Johnson thanks to his combination of size, speed, athletic ability and fantastic hands. He shows more than enough burst to run good routes, create consistent separation in the NFL, and while he is more of a finesse player that adjusts to the ball very well in the air he is not afraid of contact and does not drop passes just because contact is imminent. The Bengals would be lucky to have him fall to number four and there is no way they could pass him up considering TO’s imminent departure and Chad Johnson’s recent decline as he has gotten older. The Bengals need a future #1 wide receiver and A.J. Green has that written all over him regardless of his 40 yard dash time. The Bengals would be lucky to have him, and a receiving core of Johnson, Green and Jordan Shipley would be a pretty nice group. We all knew Miller was talented, but he has really improved his draft stock this offseason. 5th– Arizona- Von Miller, OLB, Texas A&M- Von Miller has really boosted his stock lately as he had a strong finish to the season and a very impressive Senior Bowl showing. It is being argued that he could play 4-3 OLB at this point, but I am not sure he is that effective in coverage. However, I do think he can play the 3-4 OLB position even if he is a little undersized. Will he play right away? I’m not sure. He will need to get at least to 240 or 245 before he will be able to be anything beyond a situational pass rusher in my opinion. But he could rotate in and give a good speed rush at this point. Most pass rushers that get drafted this high aren’t ready to walk into the NFL and contribute right away. They have a lot of potential but they need to be developed, improve their pass rush moves and potentially bulk up. Miller has a great speed rush, especially when standing up, so I think that makes him a good fit for a 3-4. Is the top five a little high for him? In my opinion, yes. He is a good player, I have thought he was a top 15 guy for a while, but top five feels high especially since he will need to add some weight and develop for a year or so before he can contribute as a starter. Nick Fairley has the potential to dominate at the UT position, but you have to worry about him being a one year wonder. 6th– Cleveland- Nick Fairley, DT, Auburn- Nick Fairley may have gotten bumped down to the #2 defensive tackle in a lot of rankings after Dareus’ combine performance, but I think a lot of his press about going #1 was caused by Auburn’s media hype after they won the National Title, especially since Fairley was so dominant late in the season and in that championship game. Fairley is a top five talent in my opinion, but so is Dareus, so really they are 1 and 1a in my opinion. However, Dareus went off the board first so Fairley was the one who ended up dropping here. 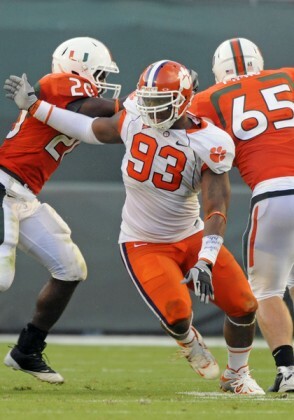 I think Fairley can be a great UT in a 4-3 and he reminds me a lot of Kevin Williams to be honest. He isn’t as tall or as big as Williams is, but he has impressive burst off the ball for his size, he is incredibly disruptive versus the run and he collapses the pocket very well as a pass rusher. I think Fairley deserves a lot of consideration in the top five, but I am sure the Browns would be more than happy to snap him up to help them transition back to a 4-3 defense. 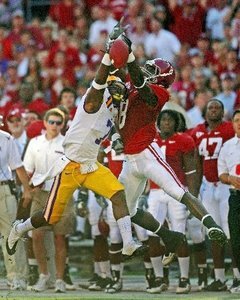 Patrick Peterson is a dynamic corner and return man that could easily go higher than this on draft day. 7th– San Francisco- Patrick Peterson, CB, LSU- Peterson is an incredible talent and I really think he could end up in the top five once all is said and done, but because Champ Bailey resigned with the Broncos I don’t think cornerback is a position they can draft #2 overall thanks to all the money they invested in Bailey. I could see them drafting another corner later in the draft, perhaps even as high as the second round, but picking Peterson #2 overall is a ton of money to invest in one position, especially considering the problems they have had rushing the passer at times. So I think Peterson slides a bit and ends up at #7 where the 49ers have no choice but to pick him. The 49ers could very well end up picking Gabbert here, but Peterson would address a huge need at corner because Nate Clements has lost a step and isn’t worth the huge pay day they gave him, so they need an infusion of talent and boy does Peterson have a lot of that. He has an amazing combination of size, athleticism, speed, ball skills and he is even a great return man. He is an incredibly gifted athlete and that’s why the 49ers won’t be able to pass him up here. And if they don’t think he’s a perfect fit at corner I still believe he could be an amazing safety, so he offers some flexibility in that respect. Blaine Gabbert has a great combination of size, arm strength and accuracy. He is also mature for only having started for two seasons. 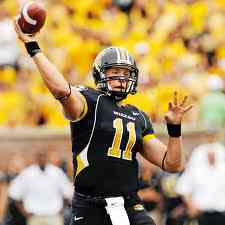 8th– Tennessee- Blaine Gabbert, QB, Missouri- I have maintained for some time that Gabbert is the best QB in this draft even if he has some serious question marks because of the offense that he played in at Missouri. He has very impressive arm strength and even though he struggles a lot with deep passes he is incredibly accurate within 25 yards and he can throw passes with great zip and velocity in that range. I don’t know if he will ever throw a great deep ball, but he has enough arm strength to stretch the field even if he doesn’t connect very often on throws over the top. Gabbert also displayed his very underrated mobility at the combine when he ran nearly as fast a 40 yard dash time as Cam Newton which surprised a lot of people. Newton has pretty good straight line speed, as does Gabbert (he’s a huge guy so when he gets moving in a straight line he can really get going) but Gabbert doesn’t have the same short-area quickness that Newton does. Regardless, I think Gabbert is a very good QB prospect and while I don’t think he is worth a top five selection I definitely think he has top ten to fifteen potential. The Titans really need a QB because of the Vince Young fiasco and eventually Kerry Collins is going to have to retire, so getting Gabbert now will give him at least a year to develop behind Collins or whoever they decide to start at QB before he is expected to start. That will hopefully prevent him from being forced in too early. However, with Collins at the helm I could see Gabbert becoming the starter around week eight or nine if we even have a season next year just because the playoffs may be out of reach by that point and the coaching staff might like to get Gabbert some playing time. Cameron Jordan definitely has top ten talent. 9th– Dallas- Cameron Jordan, DE, California- Cameron Jordan has definitely improved his draft stock this offseason as he was quietly rising draft boards before the Senior Bowl. Now everyone knows about him and I would be very surprised if he made it out of the top fifteen selections, especially with all the potential 3-4 teams that could be interested in him. I think Dallas could very well end up taking him because Marcus Spears has just not turned out like they would have hoped, and both of their DE spots could be upgraded even if they resign him. That makes DE a huge need along with safety, so with no safety worth this selection I think Dallas will go with Cameron Jordan to upgrade their defensive line. 10th– Washington- Julio Jones, WR, Alabama- Washington could use an upgrade at QB here, but with McNabb and Rex Grossman they have enough veteran experience at QB to put off drafting a QB at number ten. However, they definitely need a wide receiver because outside of Santana Moss they have very little talent at WR. Julio Jones put on a clinic at the combine and has as much potential as any receiver in this draft. He has a great combination of size, speed, and strength. He offers impressive effort as a run blocker plus he has great hands and makes some incredible catches. His concentration is inconsistent though and he will drop passes that should be routine catches for him at times. However, because of his great potential he definitely warrants a top fifteen selection and because of the glaring need at the WR position the Redskins seem like a perfect fit for him here regardless of who their quarterback is. Amukamara would finally give the Texans some talent at corner, and is the BPA at #11. 11th– Houston- Prince Amukamara, CB, Nebraska- The Texans have had a bad secondary since they were founded and rarely have they had much talent to speak of at corner or at safety. I think they will need to invest in a couple defensive linemen so that they can begin to embrace their transition to a 3-4 defensive scheme but because Amukamara slid to #11 here he is the obvious choice for a team that has been hurting at corner for as long as they have existed. Amukamara has impressive size, he’s physical, he has good ball skills even if he doesn’t have ideal hands for the interception, and I definitely think he has #1 corner potential. 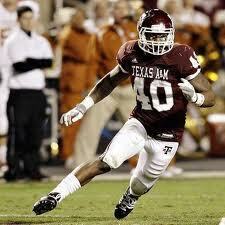 The Texans would be very lucky to get him here as he is a very legitimate top ten talent. Liuget is a legitimate top 15 talent in my opinion, and the Vikings would be well-advised to draft him instead of a QB. 12th– Minnesota- Corey Liuget, DT, Illinois: This might seem high for Liuget (pronounced “Legit” how awesome is that) but I think he has a chance to go this high. 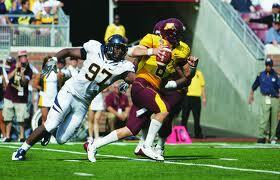 I am really high on him as a defensive tackle prospect and I think he could be a great fit in Minnesota. They figure to continue running the Cover-2 scheme with Leslie Frazier assuming the head coaching vacancy left by Brad Childress but I think DT is a huge need for them right up there with QB and Safety. There is no safety worth this selection, and honestly I think they need to sign a stop-gap QB like Matt Hasselbeck or Kyle Orton if he is indeed a free agent (or Donovan McNabb if the Redskins do actually get rid of him) because any of the QB’s they could pick in this draft will need time before they can step in and start. There is not a Matt Ryan, Joe Flacco or Mark Sanchez in this draft class. So, I think the Vikings should fill one of their other needs with a BPA pick here and honestly Liuget might be that guy. When I put together my new DT rankings he will probably be #3 behind only Dareus and Fairley. He would play very well next to Kevin Williams because he is very strong and holds up pretty well versus the run but can also penetrate, make plays in the backfield and get pressure on the QB. Plus he would inject some talent at a position that desperately needs it because outside of Kevin Williams the cupboard is pretty bare. Smith has elite athleticism for a NFL left tackle, but his technique is still a work in progress. 13th– Detroit- Tyron Smith, OT, Southern Cal: This might seem high for Tyron Smith because he played RT at USC and hasn’t really made a name for himself at USC. However, he is arguably the most athletic offensive tackle in the draft and honestly reminds me a lot of D’Brickashaw Ferguson because they both have some trouble keeping weight on and getting up to 300 pounds, so it will be interesting to see how much he weighs in at when he’s at the combine. However, he should put on a show there because he could very well run a 4.8 in the forty yard dash and surprise people with how athletic he really is. 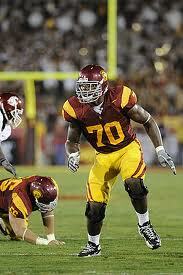 He really is an impressive physical specimen and I think he will be fine moving to LT in the NFL. He is still raw despite starting for over two years at USC, but I have seen him mirror corners blitzing off the edge, so his lateral agility and kick slide is pretty amazing for someone his size. He moves very well in the open field too and gets to the second level easily, but he needs to improve his technique and improve his fundamentals as well as add weight before he can step in as a starter. That is probably ideal for Detroit because he has a very high ceiling but with Jeff Backus still entrenched as the starter he won’t be rushed in before he is ready. Tony Ugoh is still listed as the back-up, but I don’t think having Ugoh on the roster as a back-up is enough to pass on Tyron Smith if they think he can be their franchise left tackle, which if he gets coached up well and patiently developed he definitely could be. Quinn is an impressive athlete but he is still raw and has a lot of question marks. 14th– St. Louis- Robert Quinn, DE, North Carolina- I have openly wondered for many months why so many people didn’t think that Robert Quinn’s season long suspension would hurt his draft stock (which was top five before his suspension and even after) similar to what happened to Dez Bryant last year, but up until recently that didn’t seem to be the case. We all know that Quinn is a good athlete, but I have never really bought into the comparisons to Julius Peppers. Peppers is a freak athlete and while Quinn is certainly a good athlete he isn’t as freakish as Peppers is. Plus he is extremely raw and while he has good potential as a pass rusher he isn’t elite because his technique is very likely undeveloped. Plus he is very hard to judge because there is so little tape on him and that is from his sophomore season from over a year ago. He is a very big boom or bust guy in my opinion and while I think he has the potential to be a quality pass rusher in the NFL he has just as much potential to be an impressive athlete who never amounted to anything more than a third down specialist. Mark Ingram is one of the most well-rounded running backs to enter the draft in years. 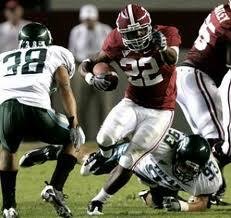 15th– Miami: Mark Ingram, RB, Alabama: This feels like a really cliché pick to me but I think this could actually happen. The Dolphins don’t have a ton of needs and with Newton and Gabbert off the board I don’t think a QB is an option here unless the Dolphins get enamored with Locker as a potentially ideal wildcat quarterback. However, as everyone seems to state in their mock draft, Ronnie Brown and Ricky Williams are both getting older and while neither of them has completely worn down Ronnie Brown has had some trouble staying healthy and Ricky is older than a typical complementary back because of his time off from the wear and tear of the NFL. Ingram would be an ideal back to bring in to take pressure off of these guys because the Dolphins running game is the heart and soul of the offense. I have never been a big Chad Henne fan because I have always thought he was incredibly inconsistent and he could make a great throw and follow it up with one or two terrible decisions or passes. I haven’t watched a lot of Dolphins games, but when I have seen him he will look good when I’m watching him and then look like a different player just minutes later. Quarterback is definitely something that needs to be considered for Miami, but Jake Locker’s inconsistency might remind them too much of Henne despite his vastly better athleticism and Ingram is one of the safest picks in the draft if he can stay healthy because he will grade very high as a feature back. If he stays healthy he could very well have seven or eight 1000+ yard seasons with 8+ touchdowns once he becomes the feature back for Miami. Clayborn may not be a sack-master in the NFL, but he can still be an effective LE in a 4-3. 16th– Jacksonville- Adrian Clayborn, DE, Iowa- Clayborn has his question marks, such as his Erbs Palsy and he had a down Senior season in my opinion, but he is still a quality defensive end. I don’t think he will be a sack specialist in the NFL, but I think he can be a dependable LE in a 4-3 scheme because he can play the run well, he has very violent hands and while he may not be a burner off the edge he has enough burst to occasionally get outside. I also think he is versatile enough to slide inside to DT in obvious pass rush situations to give the defensive coordinator some flexibility on third downs. Clayborn may not be a sack master in the NFL but the Jaguars need some dependable production from a defensive end in round one and you know what you are getting with Clayborn as long as his nerve damage doesn’t prematurely end his career. Heyward projects perfectly to the 3-4 DE position in the NFL and reminds me of Richard Seymour. 17th– New England (F/ OAK)- Cameron Heyward, DE, Ohio State: This might seem high for Cameron Heyward, but everyone seems to be underrating just how dominant he can be as a DE and DT in a 4-3 or as a 3-4 DE. He has great size, he is extremely strong and has great hand usage. He can absolutely toss some blockers around like rag-dolls (I have seen this happen to Gabe Carimi before) and he is very effective in the run game. He is literally an ideal 3-4 DE so I don’t understand why he is so underrated. However, if there is one team that will recognize how good this guy is it will be the Patriots. He would be a perfect fit in their defensive scheme because he can hold the line versus the run and handle double team blocks. Additionally he can get after the passer even though he doesn’t have much speed off the edge, but at his size he really isn’t supposed to. At 17 he would be a great value, and even at this pick I think in a number of years when he is a very good starter for the Patriots a lot of people will look back and wonder how this guy fell so far. That is my bold prediction about Cameron Heyward. Watt has ideal size, length and athleticism for the 3-4 DE position in the NFL. 18th– San Diego- J.J. Watt, DE, Wisconsin- J.J. Watt has really caught fire this offseason but I think that is for good reason. Watt is a great player and he really has an incredible passion for the game and I think that makes him an incredibly attractive prospect. He has great size and length for the position, plus he is a very impressive athlete for his size. I think he could be a pretty good player in a 4-3 scheme at LE but I think it is pretty obvious that his ideal fit in the NFL is at DE in a 3-4 defensive scheme. He has the perfect size and length for the position and his solid burst and edge speed as a pass rusher will be a bigger asset in that scheme than it would have been in a 4-3 scheme where it really would have been more of a hindrance. Watt would fit in great in San Diego and I think he has the potential to be a perennial pro-bowl player in the NFL. Not only that, I think he could end up as high as #9 overall come draft day. Ayers is an well-rounded prospect and should fill the Giants' void at OLB. 19th– New York Giants- Akeem Ayers, OLB, UCLA- Ayers definitely didn’t blow the lid off the combine but he is still a quality OLB prospect. I don’t know which scheme he is a better fit in, but I think he could play 3-4 OLB or 4-3 OLB depending on the team. The Giants are first and foremost a team that likes to create pressure on the QB and Ayers can definitely contribute to that. The Giants have been looking for linebacker help for a while and Clint Sintim is just not working out, I really think he belonged in a 3-4 scheme (but that is neither here nor there). Ayers could finally solve their OLB problems and boost their pass rush at the same time which definitely helps his case to come off the board at this draft slot. Aldon Smith has a lot of raw potential but he still needs technique work and coaching up. 20th– Tampa Bay- Aldon Smith, DE, Missouri: The Buccaneers spent their first two draft selections to attempt to bolster their defensive line but now it is time to upgrade the defensive end position so that they could have a very good defensive line once all of their prospects develop. Aldon Smith could very well have been a top ten pick if he stayed another year because of his talent level, but I would be surprised if he made it out of the top 25 in this draft. He would fit in well on the Buccaneers and could form a formidable defensive front with Gerald McCoy and Brian Price in the future should all of them pan out. Carimi should have a long, impressive career at RT in the NFL. 21st– Kansas City- Gabe Carimi, OT, Wisconsin: The Chiefs have a couple needs, such as OLB and potentially CB, but offensive line might be one of the more pressing concerns. They need help at OT and Carimi is probably one of the best OT’s in this draft class even if he doesn’t project to be a great LT in the NFL. I think he offers a lot of value because I think he can be a very good RT in the NFL and potentially start very early in his career but in a pinch he could slide over to LT and hold his own. That makes him a valuable commodity both as a starter and as a back-up, which should make him attractive to a lot of teams including the Chiefs. 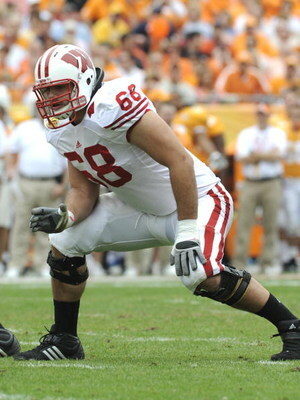 I don't think Castonzo will ever be a pro-bolwer, but he should have a solid career at LT.
22nd– Indianapolis- Anthony Castonzo, OT, Boston College: I struggled with this pick because I couldn’t decide if the Colts would look to pick up a LT to protect Manning’s blind side or if they would try to pick up a DT to help improve their disappointing run defense. Ultimately I think they will prioritize protecting Manning here and the Colts aren’t exactly a team to take a risk on a player like Nate Solder who has a lot of raw athletic ability. They seem more likely to take a player who won’t be flashy but will get the job done, and that seems to be Castonzo to a T. Will he be a franchise left tackle? No. Will he be a quality offensive lineman for a long time? Probably. He has above-average athleticism and pretty good technique, so he should be a pretty good tackle for the Colts and should help keep Peyton Manning upright. 23rd– Philadelphia- Brandon Harris, CB, Miami: The Eagles have little talent opposite Asante Samuel and they have had injury issues at this position. They tend to go after offensive and defensive linemen, and if Gabe Carimi lasted this long I could definitely have seen him being the pick here. However, they also need playmakers in the secondary especially at corner and Harris brings that to the table. He is a bit of a risk-taker like Samuel is but he has good ball skills and impressive athletic ability to close when beaten. He is a very fluid athlete with good ball skills, so teaming him up with Samuel could really help bolster their secondary. Kerrigan may not be an elite athlete, but his work ethic and motor are second to none. 24th– New Orleans- Ryan Kerrigan, DE, Purdue- Kerrigan may not be the most amazing athletic specimen in the draft but he definitely has good athletic ability and his work ethic and motor are second to none. That means he is going to get every bit of production he can out of the talent he has been given and that is why I think he is worth a late first round pick. I don’t think he will be a 10+ sack guy in the NFL, but at LE in a 4-3 scheme I think he can definitely rush the passer effectively (especially for that position, it’s hard to find a quality pass rusher at LE in a 4-3 defense) and once he gets stronger and adds some weight I think he will hold up well versus the run as well. New Orleans really needs a pass rusher to help out Will Smith and while Kerrigan won’t draw doubles from Smith any time soon he can definitely make teams pay for ignoring him which is really all you can ask for from a LE in a 4-3. Locker has a lot of potential but I don't think he will ever be a franchise QB. 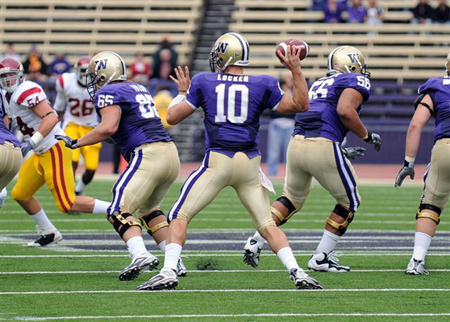 25th– Seattle- Jake Locker, QB, Washington: This seems like a match made in heaven. The Seahawks have a couple of stop-gap guys in place with Hasselbeck (who is a free agent) and Charlie Whitehurst (who I thought looked solid against St. Louis, but again it was St. Louis) at quarterback which would allow Locker time to develop behind at least one veteran quarterback. That would prevent him from being rushed into the starting job before he was ready (hopefully) and would give him the best chance at NFL success in my estimation. He has off the chart intangibles but his accuracy and ball placement was just too inconsistent for me to be that impressed. He is a very polarizing prospect as you either seem to love him or hate him, but I find myself thinking that he will not live up to the hype that was created for him by his biggest fans but I also don’t think he will turn out to be a colossal bust like his biggest critics think he will be. I don’t think he will be a franchise quarterback, but I think he can be an effective QB in the NFL who completes 58% of his passes and extends drives with his legs. He won’t ever be incredibly accurate, hence my doubts that he will have a career completion percentage of over 60%, but he has good arm strength and such a good work ethic that I don’t think I can bet against him having a solid career as a NFL starting QB. I’m sure he’d love to stay in the state of Washington and play for the Seahawks, so that would be even more motivation to work (not that he needs it). Wilson is an incredibly impressive athlete and I think he could become a superstar with Ray Lewis' as a mentor. 26th– Baltimore- Martez Wilson, ILB, Illinois- Wilson has been my #1 ILB for months on my rankings but he is finally getting some love after his very impressive combine performance. He is a very gifted athlete and I think he would be an ideal replacement for Ray Lewis in Baltimore. The Ravens have been searching for a future replacement for Lewis for years, but Wilson is a big, physical freak who has pretty incredible athleticism for his size. He may not be the imposing hitter that Ray Lewis is, nor is he as instinctual, but as he watches more film and becomes more of a student of the game like he has over the last year or two at Illinois I think he will learn to take some better angles and will show more comfort in zone coverage. He supports the run well though and has the size and strength to shed blockers and stop ball carriers between the tackles. Plus his sideline to sideline speed is so phenomenal that he can make tackles that a lot of linebackers wouldn’t be able to get to even if he doesn’t have great hip flexibility to turn and run. Wilson may not be a Ray Lewis clone but he is definitely an impressive linebacker who could really gain a lot from having Lewis as a mentor for a year or maybe more. 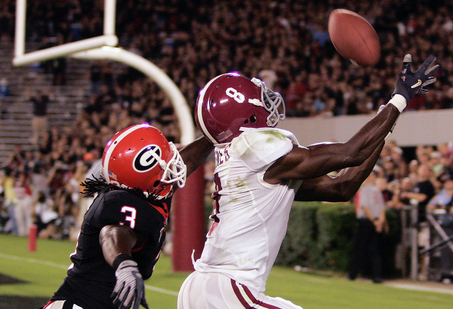 Hankerson has dramatically improved as a receiver over his four years in Miami. 27th– Atlanta- Leonard Hankerson, WR, Miami- I am not super wild about this pick for the Falcons but I do think it is a likely pick. Hankerson is an experienced receiver with good size, impressive straight line speed thanks to his long strides and he had a very productive senior season for Miami. He adjusts to the ball well in the air, he has really improved dramatically over the last two years at Miami and while I still think he is a bit of a stiff athlete as a route runner and after the catch he definitely threatens the defense with the deep ball and has shown some willingness to go over the middle during his senior season. Again, I am not a big fan of this pick but I could very realistically see the Falcons going in this direction on draft day because of his combination of experience, production and obvious improvement over the past two seasons. 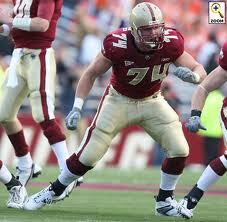 Danny Watkins may be a bit old for a NFL Draft prospect but I think he is worth a 1st round pick. 28th– New England- Danny Watkins, OG, Baylor- This might feel early for Watkins but I would not be surprised by this pick at all. Watkins seems like a Patriots kind of player even though he will be 27 by the time next season starts (if it ever does). He may be raw because of his relative inexperience but he almost seems to be a natural and the Patriots could use some talent along the offensive line and Watkins offers a lot of talent and versatility, plus he is very experienced and mature because of his age. He may not be ready to contribute immediately because he has not played football for very long, but I think he could end up going to the Patriots or the Steelers late in round one. 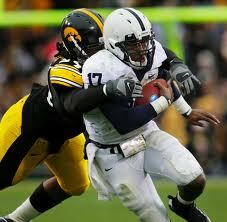 Sherrod may not be an elite LT prospect but he would give the Bears a significant upgrade there. 29th– Chicago- Derrick Sherrod, OT, Mississippi State- Derrick Sherrod may not be an ideal left tackle prospect, but in a shallow offensive tackle class he definitely warrants consideration late in round one, especially for a team that has so many holes along their offensive line. After watching him some more (not enough for a scouting report, but enough to get a feel for his game) I definitely think he can stick at left tackle in the NFL even if he isn’t an ideal fit. That is terrific news for the Bears because I really don’t think that Nate Solder is the answer to their problems at the position, and who knows what the Bears will ever get out of Chris Williams their former first round selection out of Vanderbilt. Sherrod may even be able to start as a rookie, and while he may not have a really high ceiling you know what you are getting with him: a reliable pass blocker who will also be a solid wall-off blocker in the run game, plus he is a high character guy on and off the field. 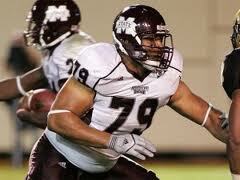 The Bears could use a reliable offensive tackle they can depend on and that makes Sherrod the obvious selection here. Taylor has really seen his draft stock rise and he has pretty incredible athleticism for a man his size. 30th– New York Jets- Phil Taylor, DT, Baylor- Phil Taylor has really improved his draft stock this offseason and the Jets would be foolish to pass on him here. They have had so many problems trying to fill their 3-4 NT position and now that the Kris Jenkins experiment has officially ended it is time to go in another direction. Grabbing Taylor here would help fill the 3-4 NT position for the next decade and it would really do wonders for their defense in my opinion. Nose tackle is a position that can make or break a 3-4 defensive scheme because of the tremendous impact that player has in the running game so getting a potential stud like Taylor would be ideal for the Jets. 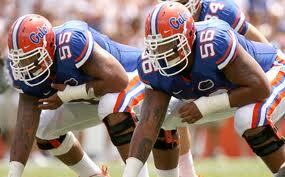 Pouncey could very well end up playing next to his brother Maurkice in the NFL. 31st– Pittsburgh- Mike Pouncey, OG, Florida- This really does feel like a cop-out to me but because Watkins is off the board I think it is the most logical selection. The Steelers offensive line needs another piece, whether it is a RT to allow their current tackle to slide inside or a guard to fill the void that the current RT would have slid in to fill. There isn’t a good enough OT on the board to pass on Pouncey, so he is the logical selection here. He was at his best last year when he was playing next to his brother Maurkice so why not reunite them and let them mow down defenders for Rashard Mendenhall and company? I don’t think Pouncey is the same prospect his brother was and he certainly won’t make the pro-bowl as a rookie like Maurkice did, but he is definitely one of the best guards in this draft class and warrants at least early-mid second round consideration, but could definitely sneak into the very late first round because of his name recognition thanks to his brother’s fantastic debut in the NFL. Reed would fit in perfectly in Green Bay because of his athletic ability, non-stop motor and long blonde hair. 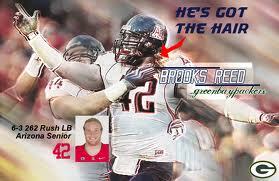 32nd– Green Bay- Brooks Reed, DE/OLB, Arizona- It took me a while to think of what direction the Packers would go here but suddenly it hit me: What do the Packers like more than cornerbacks with dreadlocks? Linebackers with long blonde hair. Well Brooks Reed has more than enough hair and speed off the edge to make Packers fans drool and he would look terrific playing opposite Clay Matthews in the Packers 3-4 scheme. Like Matthews he has a terrific motor and he just does not quit on plays and will chase plays down from the backside that a lot of players just wouldn’t be able to do. He tested very well at the combine and I think the Packers would be geniuses to grab a potential Matthews clone in Reed and let them both terrorize opposing quarterbacks from the OLB position for the next decade. Thanks for reading, this mock took a long time to get ready so I hope you all enjoyed it. Let me know what you think!